Say you are travelling in a Mumbai taxi or auto-rickshaw (auto). And the driver misbehaves. Or takes the vehicle via a suspicious route. Or you’ve forgotten your belongings in the vehicle. 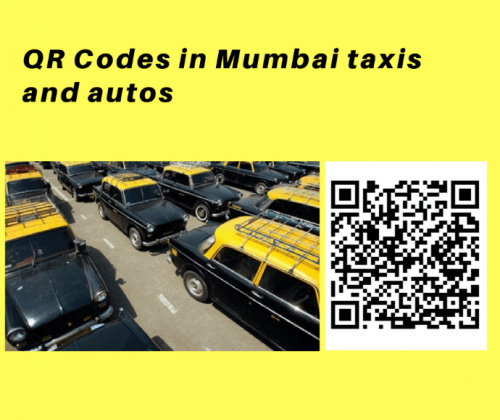 To deal with these issues, the Maharashtra State Government in India has announced introduction of QR Code in Mumbai taxis and autos. The State Government authorities are working to develop an easy-to-access safety system during emergencies in these public transport vehicles. “We are working towards having QR Code system in autos and taxis to ensure passenger safety”—Amitesh Kumar, Joint Commissioner of Police, Mumbai Police. Misbehavior with women in these public transport vehicles is a serious issue in Mumbai. So the system will especially enhance safety of women passengers. Also see how City admins are using QR Codes to make lives of citizens simpler. A QR Code will be compulsory for all the taxis and autos. Failing this, they will not get fuel at petrol pumps throughout the Mumbai region. Such vehicles will be illegal and eliminated from the transport ecosystem. The system will be applicable to mobile aggregators (Uber, Ola, etc. ), black-and-yellow city cabs, and autos. Each driver will get the QR Code only after thorough verification of vehicular records. This will further help the Department update their records. Also see the common use cases of QR Codes in India. Every taxi and auto will have a QR Code pasted on the vehicle. This will enable passengers to scan the pasted QR Code with their smartphones. The State Government is going to fund the project. The Auto-Union is happy with the project. They are content that the system will eliminate all unregistered taxis and autos from the roads of Mumbai.